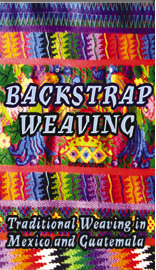 Nowhere are the skills of backstrap weaving so widely practised as in Guatemala and Mexico. 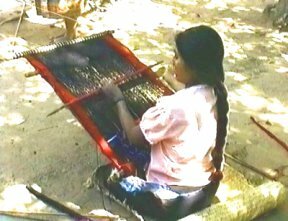 Everywhere weavers can be seen sitting down to weave, under a tree, in front of houses, inside open doorways. Complex and colourful designs reflecting thousands of years of tradition and skill are still produced from a few sticks and balls of yarn. This film unravels the secrets of backstrap weaving and shows how the ancient Amerindian cultures survive through it. Filmed in Mexico and Guatemala. Contents: The backstrap loom ,warping up a backstrap loom for a 4 selvedge weaving and different weaving techniques, such as warp pick up and brocade, used to produce an amazing range of multicoloured huipils and cloths.